The unlimited money, keys, items and gems hack for Attack the Light is now available for free download onto your Android phones and tablets. The game is based on the popular Cartoon Network series Steven Universe and it fits perfectly into the RPG adventure genre. If you've watched the show then the story is almost the same. 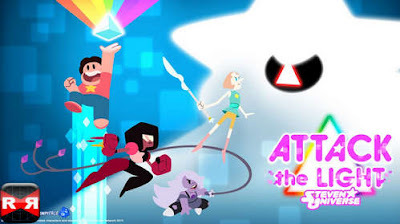 Attack the Light (apk) takes the Crystal Gems on an adventure to restore the seven light creatures, which Steven unknowingly let escape by touching a light prism gem artifact. The game has players control a team of four heroes. Three Gems (characters) with different super powers who do all the battling, and Steven, who's a bit of a weakling and plays a support role to the Crystal Gems. Using Steven Universe - Attack the Light mod apk, players will be able to play with all kinds of unlimited powers and unlocked items, without which progressing through levels will be a hassle. You may also grab the original paid game version if you like to play at your own pace and grind for gems, star points, and xp! Install the v1.1.4 apk, Extract Data to internal sdcard /Android/Obb/, and play!